​It is recommended that Jeff’s selections be used to augment the reader’s own personal handicapping, though excellent results can be achieved by applying the exact rolling exotic strategy specified by Jeff’s analysis. Jeff’s recommended plays are intended for players with a moderate budget; however, readers are encouraged to adjust Jeff’s wagering strategy to fit their preferred investment level. ​Unless otherwise noted, all horses listed in the analysis should be used in rolling exotic play. 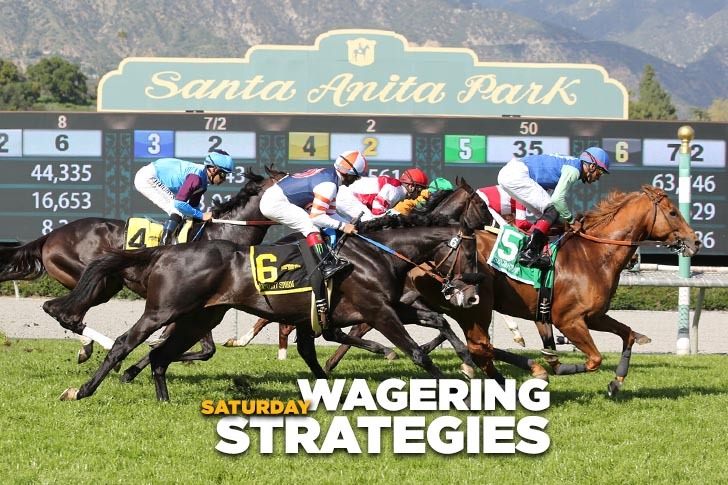 Usually there will no more than three horses listed; occasionally, Jeff will go four-deep in his rolling exotic play and on a very rare occasion he will recommend a “buy the race” strategy. Forecast: Raul Rosas ran like a short horse in his recent comeback, and if can produce a forward move over a wet/fast sloppy track that he’s bred to like he might be able to outrun this field. Cyclometric, fourth in the same race ‘Rosas exits, also seems better than that race shows. A repeat of his maiden win during the fall meeting puts him in the thick of it. Tread lightly in this race (and throughout the day) over a surface that some may love, and others may dislike. Forecast: Kochees may have lost his best chance with a slow break vs. tougher last month but if he can leave well from the rail today he should be a strong factor throughout. We like the blinkers off angle and his pedigree that says he should handle the wet track. Past-classer Denman’s Call is a first-off-the-claim for Glatt following a nice win last month and a similar effort today makes him dangerous right back. The wet track shouldn’t bother him. Forecast: ​Pioneerof the West moves up a level following a useful win over a wet-fast track at this trip last month and not much improvement will be needed for a repeat score. He’s one of several in the field with a legitimate look, so best advice is to include as many as you can afford to in rolling exotic play. Bedeviled probably needed his comeback race and today stretches out to a more favorable trip. He should be running on late. Forecast: Leveler has been away for almost two years, but she returns protected and has a lights-out pedigree for an off track. She’s trained well enough to be fit for a barn that has excellent stats with layoff runners. Tyfosha usually gets a piece of the purse but against this below-par field for the level could break through with her first win in more than a year. She exits a couple of tough races and today’s wet track shouldn’t be a problem. Forecast: One Bad Boy caught the eye (see our Black Book video analysis) with an excellent third place effort in his debut and seems certain to produce a significant forward move assuming, of course that he handles the wet track. Off the rail and with the switch to Rosario, the son of Twirling Candy should flash more tactical speed today and have every chance from the top of the lane to the wire. Omaha Beach shortens to a sprint for the first time in his career, and as a son of War Front may appreciate this seven-furlong trip. His numbers are solid, Prat stays aboard, and the Mandella-trained colt, having failed as the favorite in each of his first four starts, gets one more chance to shed his money-burning reputation. Forecast: ​Mucho Gusto couldn’t handle Improbable in the Los Alamitos Futurity, but his runner-up effort was franked when third place finisher Extra Hope came back to romp in a strong first-level allowance event earlier this week. The son of Mucho Macho Man should be able to cope with the wet track based on pedigree. Nolo Contesto just graduated two-turning like a nice prospect from Omaha Beach (see fifth race) and earned a strong speed figure in doing so. We’ll be surprised if the winner isn’t one of these two and both should be included in rolling exotic play. Forecast: R B Eye may not be all that, but this will be the first sprint of his career and we suspect he’ll improve at this shorter trip. In a modest maiden claimer for sophomores, the son of Cairo Prince gets a break in the weights with the switch to Espinoza and seems as good as any based on his route speed figures. Toby Time finished far bark in his debut while facing infinitely tougher straight maiden foes. The son of Gio Ponti adds blinkers, retains Pedroza, and probably is better than shown. Camzul is a first-timer from a low-profile outfit with a bullet drill from San Luis Rey Downs. He represents stranger-danger, so we’ll toss him in. Spread as deeply as you can in this unclassified affair. Forecast: My Mandate probably can’t beat a real good maiden, but it probably takes a decent maiden to beat him. The Glatt-trained sophomore lost a toughie in a recent Hillside turf sprint, and a similar effort over today’s sloppy/wet-fast track probably will be good enough. Time Is Now is a first-timer from the Mandella barn with a tough task from the rail, but his pedigree says he’ll love an off track and the works show promise, so we’ll include him on a ticket or two in rolling exotic play. Forecast: ​McKinzie was spectacular winning the opening day Malibu Stakes and this stretch out to nine furlongs won’t be a problem as the son of Street Sense was a Grade One winner at this distance last fall in the Pennsylvania Derby. He’s 4/5 on the morning line and looks it on paper, though the Baffert-trained colt is unproven over the sloppy/wet fast main track that he’ll encounter today. Battle of Midway is rounding back to his Breeders’ Cup Dirt Mile form and ran a highly-respectable third over a very wet track in the 2017 Kentucky Derby, so the wet surface might help him. Additionally, the son of Smart Strike should enjoy a lovely pace-stalking trip. Forecast: Das Bear is an educated guess in this wide-open restricted (nw-2) $12,500 claiming sprint in which nothing would surprise us. Away since last May, he returns cheap over a wet track he should handle, and he’s competitive on numbers based on his maiden-claiming win at Emerald Downs last time out. However, the barn has poor stats with layoff runners, so who knows? Candyman Garret is a first-off-the-claim for Mullins while making his first start since September, so improvement is possible, but he must leave from the rail on a wet track that he may or may not like. He does have good early speed, so if he breaks well he could be a strong early factor. Isee It in Hiseyes is a fit on numbers based on his distant second place effort at this level over a wet-fast track last month. He may lack a winning punch but usually lands in the frame.